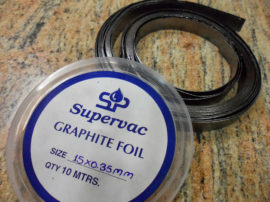 Supervac manufactures Graphite foil (SV-GF). These foils are manufactured by a patented process of EXFOLIATION and hot pressing: a technology which very few companies in the world possess. Because of its excellent electrical conductivity, anti-corrosion and thermal resistant properties coupled with compressibility and flexibility, SV-GF works outstandingly in various applications. 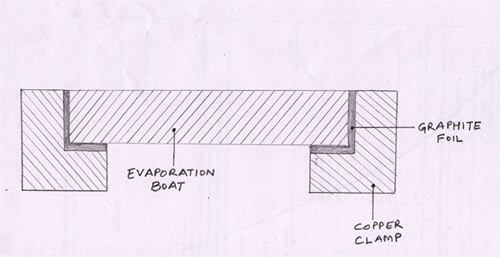 As shown in fig.1, graphite foil is used as an electrically conducting gasket between the hot evaporation boat (up to 1500⁰ C) and the copper clamps. It serves various important functions here. It has to let as much as 700 amps. of current pass without any resistance. On one side, it has to protect the expensive evaporation boat from getting over-heated and cracking. On the other side, it has to protect the copper clamp from overheating and melting. Good quality graphite foil performs all these functions effortlessly. SV-GF’s pure, compressive strength packs in denser amounts of graphite per sq.cm. If, for the sake of cost cutting, cheap plumbing grade graphite foil is used, it causes immense damage to the machinery, the process and the product involved. These low grade graphite foils contain various binders like rubber compounds, adhesives and resins etc. in them. Therefore they are not 100% pure. On being used inside the vacuum chamber, these binders release various gases which affect the vacuum adversely. Also, these gases adhere to the thin film being metalized and bring down the quality of metalizing. Because of binders conduction is not 100%. This causes current loss, sparking and overheating of Evaporation boats as well as of Copper Clamps. Very Pure – should contain no bonding agents like adhesives, rubber compounds or resins. Temperature resistant- in the absence of any binders, pure graphite SV-GF can withstand very low temperatures of cryogenic liquids like liquid oxygen to very high temperatures like those of molten metals like molten steel and aluminum. Self-lubricating – should have a very low co-efficient of friction to prevent cleaving and grazing between machinery parts. SV-GF comes with all the above qualities. It is available in all the sizes for the convenience of our valued customers.